It's also here that I generally recommend you check out Sepinwall's similarly not-set-in-stone reactions to these pilots. He's so far ahead of me on his pilots that he's started reviewing episodes of a series that was cancelled seven years ago. That's just plain cocky, if you ask me. The Pitch: "Men in Cars." Quick Response: "Carpoolers" is so mediocre and middle-of-the-road that I can't begin to figure out either what ABC thinks its upside is or why this was a comedy that ABC felt the desire to send to series in the first place. In 23 minutes of screentime, I never came close to laughing a single time, but I couldn't bring myself to mind. I guess I think the fat kid from "Stand By Me" is a likeable guy and I guess I'm inclined toward some warn feelings for Fred Goss stemming from "Sons & Daughters" (a show I didn't like very much, but which I *wanted* to like). I've always thought Faith Ford was cute and funny and I feel the same way about Allison Munn, though they're both background characters in this comedy about men going to work in the morning. Huh? Yes. That's the plot and, after watching the pilot, I don't really see where the series is here. Yes, the four men are all in different phases of their romantic lives, but none of them are in interesting or original phases. And how entertainingly can these banal stories be told if they're rendered in the close confines of a fake automobile? Oh and why is this a single-camera comedy anyway? The pilot looks ugly and cheap. Desire to Watch Again: Low. ABC's comedy development is just a problem. Possible Role For Eric Balfour: I guess Balfour could probably have played the Tim Peper role as the car's newcomer. He probably thinks he's too edgy for this and, sad as it may be, he's right. The Pitch: If you're perplexed at how many 30-second commercials Geico's gotten out of this thin premise, wait til you see 22 freakin' minutes! Quick Response: I don't understand the alternate evolutionary saga depicted in "Cavemen." How did a certain group of Cro-Magnon just fail to evolve over the years? And are there Cavewomen? Not in the pilot. So that means that there have been many many generations of miscegenation of homo sapien women breeding with cavemen. Is the caveman gene just dominant? Can cavemen and human women not have daughters? 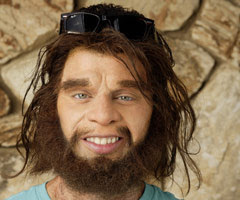 And why can't cavemen just shave and cut their hair and attempt to integrate themselves into mainstream society as really ugly homo sapiens? These are the sorts of things I saw wondering while waiting for anything in "Cavemen" to make me chuckle. The network party line that "Cavemen" is using its titular characters as minorities to discuss issues of race in America is bizarre and ridiculous on two major levels: The first and most problematic is the notion ABC's schedule is so loaded with actual minorities that the network can afford to let white men wearing latex be the official voices of race-based concerns. If ABC wants to explore issues of race in contemporary America, maybe they'd be better off recruiting minority writers and building a sitcom around minority talent rather than letting a bunch of white guys use characters from a mega-corporation's ad campaign do that job for them. The second level is just how superficially "Cavemen" covers racial differences. 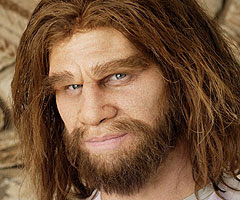 A bunch of stereotypical characteristics attributed to other races have been put onto the main cavemen. Does that mean that this is an alternate America in which African Americans, Asian-Americans and Hispanic Americans have total equality with white Americans and have just decided to band together to oppress cavemen? I'd expect a big audience the first week, rubber-neckers, followed by a massive viewer drop and a swift, humiliating cancellation. Possible Role For Eric Balfour: It would be too easy to make a joke here. So I won't. The Pitch: "My Name Is Samantha"
Quick Response: I don't know that "Samantha Be Good" is a better title for this show than "Sam I Am" was. "Samantha Be Good" is the third ABC pilot that was shot single-camera for no good reason. I know that multi-camera sitcoms are out of favor in the creative community, but none of the three ABC comedies is anything other than a traditional format delivered without a laff-track. Christina Applegate is a dependable centerpiece for a comedy, though there's a bit too much mugging and flailing in her pilot performance for my taste. She's trying to force less-than-funny dialogue to be funny. something that Jean Smart and Kevin Dunn, as her parents, do without effort. Applegate's talented enough that if the material gels, she'll be able to make it work. The problem is that I don't see how the pieces are going to come together in the weeks to come. 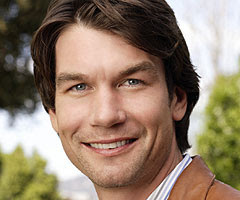 Barry Watson seems to be part of one show, Melissa McCarthy part of another, Jennifer Esposito part of another and the parents part of another. I see the most potential in the parents and possibly with Watson, while Esposito's stuff isn't funny at all. Since ABC has no marketable comedies, the network has given "Samantha" the best lead-in they have, post-"Dancing with the Stars" on Monday. But is there a precedent for success as the half-hour filling in the middle of 150 minutes of unscripted programming? Desire to Watch Again: Moderate. The people involved are funny and I'm sortta curious as to what the series will be, week in and week out. I also don't know if retrograde amnesia is a truly funny plot catalyst, or if it's an endlessly renewable source for hilarity. Possible Role For Eric Balfour: You know, I may finally have tired of this gimmick. Who'd have thunk it? I am similarly behind in my pilot reviews, I sympathize. I really, really liked Samantha Be Good. That and Journeyman are really the only shows I am excited to see what happens next. They weren't necessarily my favorite pilots, but they had the best premises for long-term success, I thought. Scheduling-wise, SBG definitely has the disadvantage being sandwiched between two reality shows, but maybe that crazy scheduling will pay off. Stranger things have happened (like Cavemen getting a green light). Your comment about what is wrong with ABC comedy development is right on. They really don't have any sort of rudder guiding them at all. It's almost fascinating to behold.